FL-X Series variable-area flowrate indicators utilize fluid movement to actuate a swinging vane, which drives the scale pointer and triggers the signal switch. The corrosion-resistant construction includes no breakable tubes, and a display that is unaffected by the opacity of the fluid. 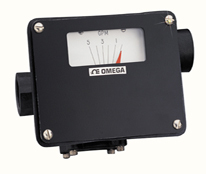 These flowmeters feature rugged construction and easily accommodate flows up to 1.5 times the maximum scale reading without damage. All internal wetted parts are made of 316 SS, and the body housing is polysulfone with FKM seals. Connections: 3 /4 " NPT, Female, Plastic.